Get a screwdriver, and you can have this thing running in five minutes. The MasterLiquid 120mm AIO hydro cooler features the superior benefit of being silent, as Cooler Master coolers boast dependability, performance and discreet operation by its unique Dual chamber and 2x 120mm quiet fans with Air Balance fan design and Push-Pull MasterFans, which propels hot air further through the radiator keeping your system efficiently cool. Including FEP Tubing and durable tube sleeves with factory-grade sealant. Many of Cooler Master's products are known for their easy installation so your build will be stress free. Cooler Master controls quality and builds on decades on innovation with 100% in-house design and manufacturing. keep hot air at bay To avoid any dynamic losses, the dual push-pull MasterFan setup provides added pressure to push hot air through the radiator. 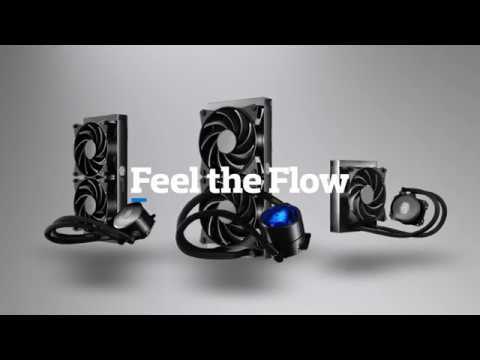 get the quietest liquid cooling One of the greatest advantages of the MasterLiquid 120 and hydro cooling in general is silence. The robust build of MasterLiquid coolers and precision machined copper plate, mean less noise and vibration, making Cooler Master's All in One coolers some of the quietest in-class. ULTIMATE COOLING OF THE PROCESSOR Its fiber-reinforced polymer (FRP) construction resists a broad range of chemicals and is unaffected by moisture or immersion in water. Cooler Master's pump is light and impervious to oxidation and corrosion. COMPATIBLE WITH INTEL & AMD SOCKETS The installation is quick and easy for both Intel and AMD platforms, with everything you need straight out of the box. Once installed, the MasterLiquid 120 requires zero maintenance for optimal silence performance. Cooler Master MasterLiquid 120, 120mm All-In-One Hydro Cooler CPU Cooler, 2x120mm Quiet Fans, PWM Intel/AMD AM4 is rated 4.5 out of 5 by 6. Rated 2 out of 5 by CJPN from Avoid if at all possible. This AIO cooler is not a 40mm radiator. It is a 20mm-ish radiator enclosed in a 40mm radiator's external casing. There is a significant gap between the radiator face and the fan on each side. Furthermore, the fans supplied with my particular unit were defective out of the box; one or both emitting the fan death-rattle when asked for more than 30% RPM. Have temporarily replaced said fans with six-year-old fans from former AIO cooling unit, which are still relatively quiet, pending replacements from Cooler Master. The strangest element of this cooler, however, was the finish on the copper base. So coarse that after peeling off the "protective" plastic and observing dirt... it cheese-gratered a high-grade microfiber cloth. Compare this to the CPU where said cloth had previously removed 95% of old heat compound without recourse to cleaning fluids - and then pulled off the remaining 5% with some alcohol. You could make wasabi with this thing. Honestly, a waste of money. And bizarre. And a bit of a con. Avoid. Rated 5 out of 5 by EnoX from Cooling Beast This All in One Hydro Cooler from Cooler Master is especially good at keeping CPU temperatures low. It normally runs the CPU comfortably in the low 20's on idle and under heavy load it goes up to the 40's. I really like the premium feel to it and the white LED that adds a lot to the PC. The only issue that I experienced is the sound of the liquid moving around upon turning the PC on. I don't know why it happens, but it goes away shortly after. 12/10 would buy again. Rated 5 out of 5 by Antandshar from Super quiet, super cool Bought this for a Ryzen build. I've used a few cpu water coolers before, but i was amazed how easily this fitted onto the board. I set the fans on the radiator to blow cool air into the case and fitted the block with the motherboard already in the case. Instructions are fairly clear. Comes with it's own thermal paste, but i'd already bought Arctic 5 so i used that instead. The fans are really quiet and the cooling is quite impressive. Running a Ryzen 1500x at 3.8ghz with no issues. Also has a cool light up logo! What's not to like! Very well made and it feels it. I would happily buy one of these again and the price is a no brainer! Forgot to mention, it has brackets for all types of Amd and Intel board. Rated 5 out of 5 by Izzy from Absolutely fantastic water cooler for the mid range buyer. I was looking to replace the Wraith Spire cooler with another air cooler that my overclocked Ryzen 1700 was using as I believed cooling to be insufficient, especially during heavy workloads and gaming, where temps often sat around 45C when idling and could reach over 80C during some games! This water cooler looked such great value that I simply couldn't justify not buying it, temperatures now sit at 25-30C when idling and peak at about 65C when gaming. My only regret is that I haven't found a new use for the amazing aesthetic of the RGB Spire cooler, but I can't blame this amazing gadget for that!